Product code: 72A022400-1 Category: Mixing Desks. L100 is the latest addition to the SSL Live console family. It provides a physically smaller premium solution for customers who prioritise outstanding sonic performance in space restricted installations, for sub-mix positions or corporate production. L100 sets itself apart with its compact, 12 + 2 fader configuration frame, while using SSL’s fast access layer / bank switching and Super-Q technology to ensure no channel, group, aux, VCA, or master is ever far away from the engineer’s fingers. 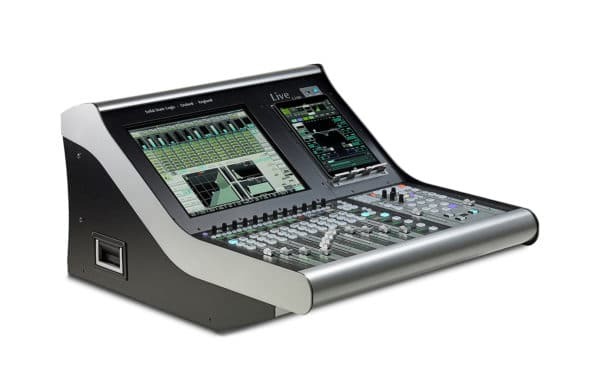 Users who require more faders can expand the L100 with the addition of SSL’s new Remote Tile and more screen space can be added via an external touchscreen and tablet control. The 17” multi-gesture touchscreen gives access to all of the console’s functions, and combines with Quick Controls in the Fader Tile to provide intuitive, immediate hands-on hardware control. The integrated tablet device stand combines with the newly released version of SSL’s TaCo tablet control application to offer an additional control interface for channel or Effects Rack processing. The Master Tile also provides Mute Group, Solo/Talkback, Assignable keys, and Automation controls.